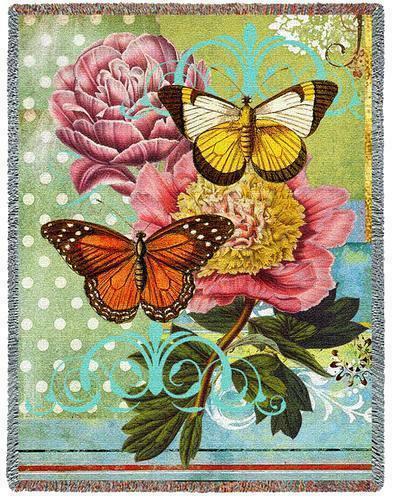 "Butterfly Tapestry Throw" Features two large butterflies set against colorful flowers with polka dots and scrolls in lovely floral hues. Makes a great gift for the butterfly lover or the nature enthusiast in general! Cotton. Woven on Jacquard looms. Measures 54" Wide x 70" Long. PLEASE NOTE: Shipping ONLY within the continental U.S. Hawaii, Alaska, and Puerto Rico must contact seller for shipping quote before ordering.